I recently caught wind of an establishment called Field of Creams Cafe, located at 550 Ramapo Valley Rd. 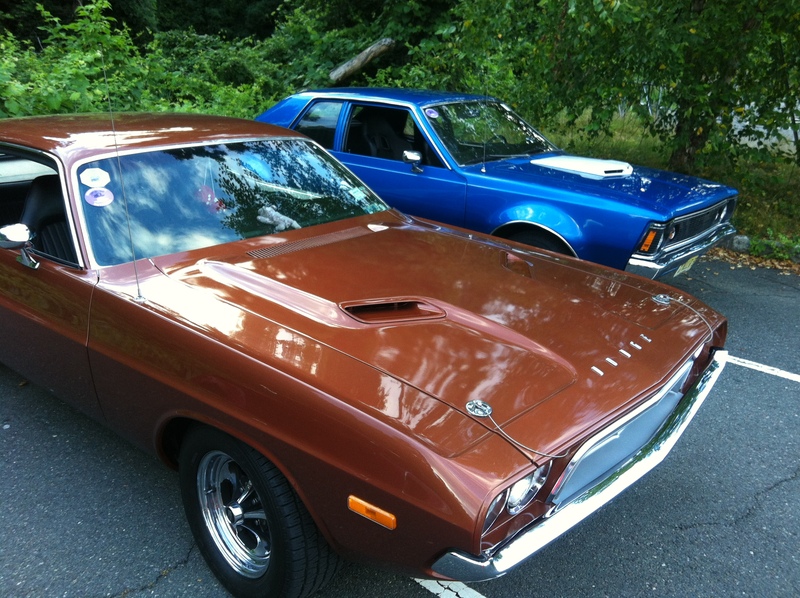 Mahwah, N.J., inside Continental Soldiers Park, that seemed right up my alley. Field of Creams Cafe is a converted concession stand in the middle of a park that serves up normal concession fare like burgers, hot dogs, and fries but adds a foodie flare with a full complement of Crepes and something called Bubble Tea, more on this strange little drink later. Not only did Field of Creams entice me with their crepe selection that includes both the savory and sweet varieties but I am a huge baseball fan that thoroughly enjoys puns, so I was attracted to the name like a hipster to black rimmed eye glasses. 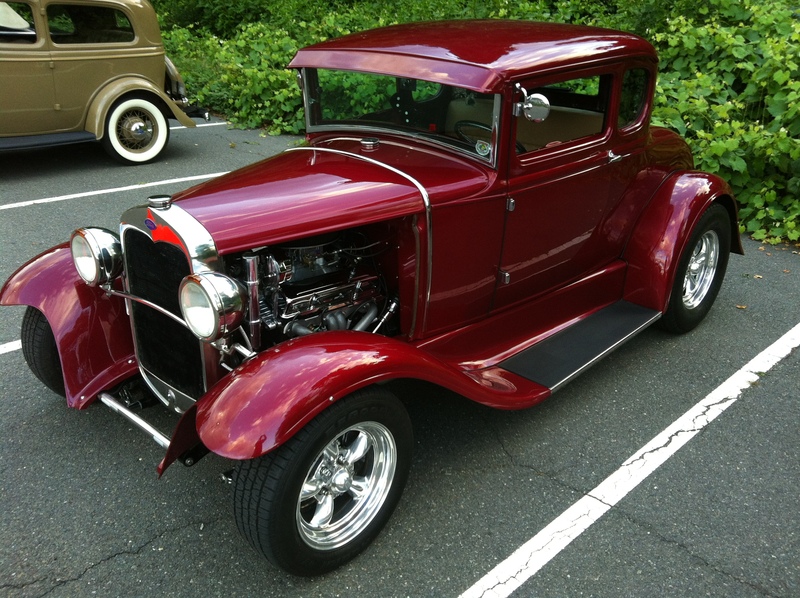 Furthermore, while perusing their website, I noticed that every Tuesday there is a vintage car show that occurs in their parking lot. Baseball Puns, Crepes, and Classic Cars OH MY, my inner monologue repeated in the classic Wizard of Oz voice as I made arrangements to get my foodie on at the Field of Creams Café on the next available Tuesday. As Kat and I approach the Field of Creams Café with our dog Lilly, the first non-human guest foodie that has joined us on our food expeditions, I was whisked back to my childhood on the Baseball Field. Field of Creams Café is quite literally a concession stand, much like the one that I used to buy Big League Chew and sunflower seeds from during my days as a little leaguer. As Kat and I discussed what to order we realized this was no ordinary concession stand. Hamburgers for $2.50, Hotdogs for $2.00, Philly Cheesesteaks for $4.00, Baby spinach, chicken & cheese crepe for $6.50, Bubble Tea for $3.00 and Nutella covered French Fries for $4.00 are just some of the highlights of the offerings at this blast from the past. We approached the counter to order after a lengthy discussion and we were met by a smiling clerk that seemed genuinely happy to assist us, which in this day and age is hard to come by. We decided to order a small sampling of what Fields of Creams Cafe has to offer and split it knowing full well we had to save room for desert. We ordered one Cheeseburger for $2.75, one Hot Dog for $2.00, a Chicken & Cheese Crepe with a side of Pesto Sauce for $6.00, and a Banana bubble tea for $3.00. After ordering they took our name and we took a seat at the nearby Picnic Tables and awaited our order. The ample seating allowed us to sit down and take in the activities that Continental Soldiers Park has to offer. A few feet from the Café itself was a rather large, fenced in, play structure perfect for children to build an appetite while their dinner is being prepared. Across the parking lot in the distance we could see a fully functional skate park for your teenage to blow off some of their built up angst before telling you the Hamburger you are about to eat is murder and chowing down on the Veggie Burger for $2.50, they ordered with a smug look on their face. Meanwhile, the Fields adjacent to Fields of Creams Café were bustling with the sounds and sights of a soft ball game and a soccer practice and the parking lot was littered with cars that were made of steel and guzzled gas by the barrel. Before we knew it, the clerk behind the counter was calling my name and handing me my very first bubble tea. Bubble tea, also known as pearl (milk) tea or boba (milk) tea, is a Taiwanese tea drink that originated from tea shops in Taichung, Taiwan during the 1980s. 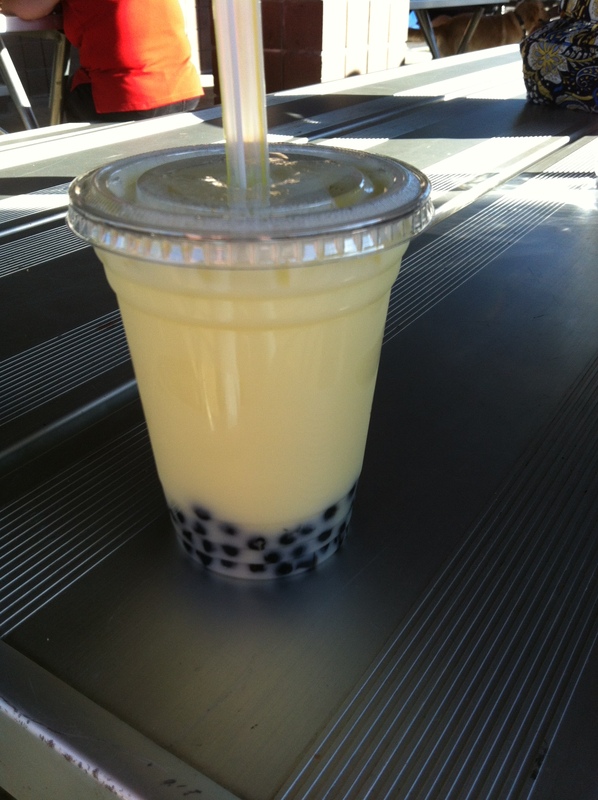 Bubble tea contains small chewy tapioca balls (fenyuan), commonly called “pearls” (zhenzhu). Additionally, there does not seem to be people who are in the middle of the road when it comes to Bubble Tea, according to the research I did before ordering it, you either LOVE it or you HATE it. I took my first sip of bubble tea from the abnormally large straw that is served with this foreign concoction and was surprised by the consistently of the Peals or bubbles. There is no real way to describe the texture that these tiny treasures bring to the table other than slightly gummy, but that does not really sound appetizing now does it. Kat and I fall into the LOVE category for this drink, but I do believe that it is a treat as opposed to a drink with a meal. The Banana flavored juice was excellent and with the addition of the petite flavorful orbs creates quite a fun drink that I will be ordering again in the near future. After we were done being both mesmerized and confused by the Bubble Tea our food order was ready and Kat retrieved it from the window. We cut each item in half and allowed the hot dog to bat in the lead off position. The dog was a standard hot dog, nothing more, nothing less. Which, when and if you have children you will be pleased to know. Even though foodies love accompaniments and frills, kids love plain and simple. The hot dog gets a single in my book, which if you know baseball, ain’t nothing to thumb your nose at. 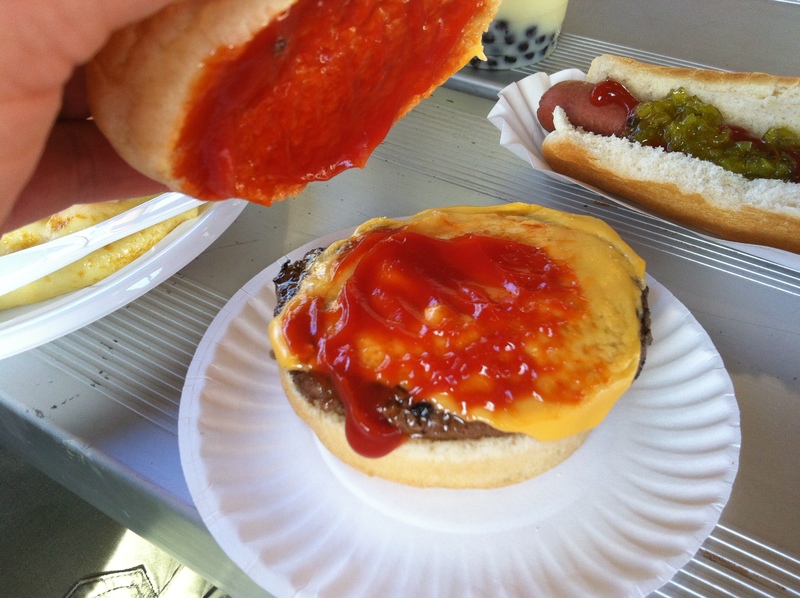 The Cheeseburger falls into the same category as the hotdog, a simple, straight forward, concession necessity for people that tend to shy away from the out of the ordinary menu items that this foodie loves and seeks out. The Cheeseburger, gets another single here, meaning there is a man at first and second for the number three hitter, THE SAVORY CREPE. 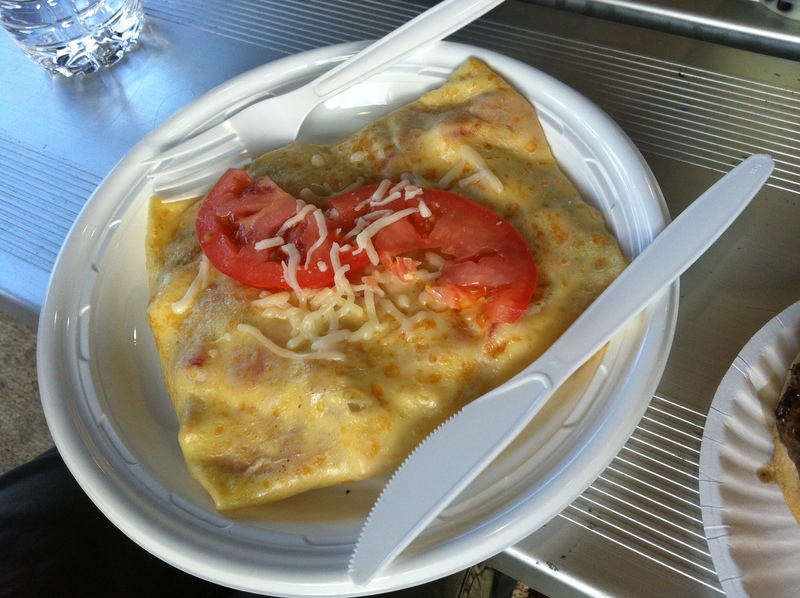 We went with the Chicken and Cheese Crepe but because Kat is not a huge fan of Spinach, we added tomato instead. This crepe was a very respectable portion considering what we paid and it was chock full of chicken, cheese and tomato. We tried this crepe without the assistance of the Pesto sauce first and we felt that it was worthy of praise but was missing something. We then dipped the crepe into the side of Pesto sauce and we watched the Chicken Crepe hit a solid triple off the wall. The fresh made Pesto sauce sent this crepe into a League of its Own, and in both of our opinions completed the dish. After the Savory Crepe hit a triple I was very excited about partaking in the desert offerings that Field of Creams is really known for. 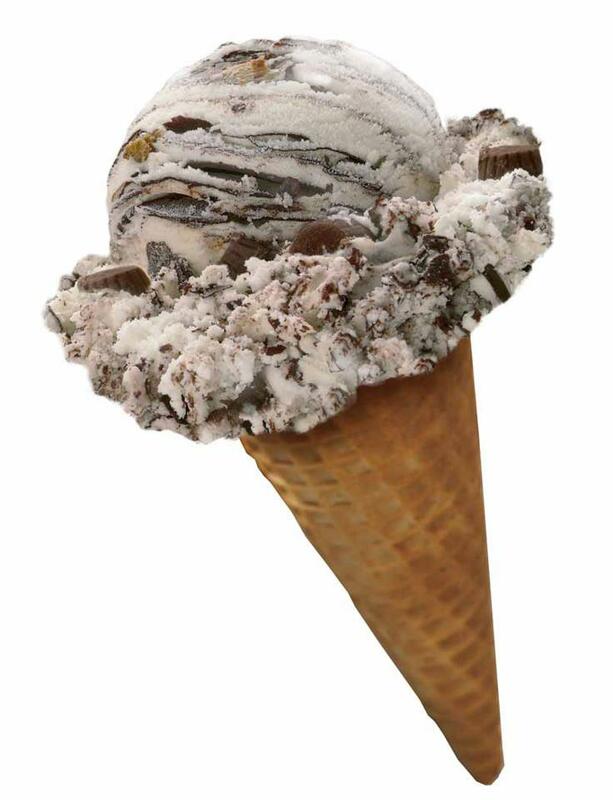 Considering that ever since I came back from France I crave Banana Nutella Crepes like a dog craves peanut butter, I ordered one of those and Kat ordered a cone full of, the almost impossible to find, Hershey’s Birthday Cake Ice Cream. The Hershey’s Ice Cream cone delivered a pretty solid double, due to the large amount of ice cream crammed inside and the overall quality of the Ice Cream itself. I had never tried Hershey’s Ice Cream before so I was not sure where it would fit in the ever-growing list of Ice Cream makers. I was very impressed by this Ice Cream, it was bursting with birthday cake pieces and the actual ice cream was very creamy and packed with flavor. 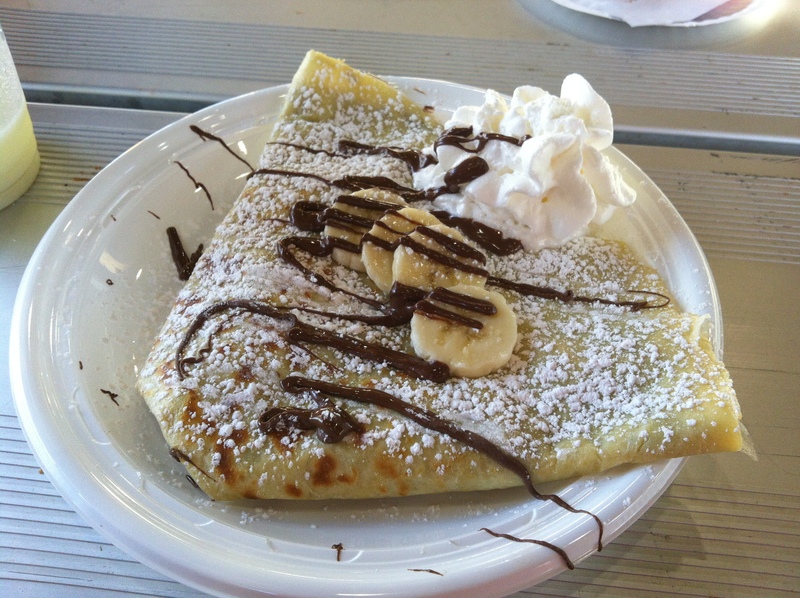 Next up at the plate was the Banana Nutella crepe. As stated before, Kat and I went to France last year and fell in love with Crepes, especially the ones of the sweet persuasion. With that said, I am quite particular about my crepes now and tend to be a rather harsh judge when they don’t come through in the clutch. Field of Creams Café’s Banana Nutella Crepe got up in the bottom of the 9th with two outs in a tied ball game and crushed the first pitch out the park for the walk off win. This sweet crepe brought me and Kat back to the streets of Paris bite after bite as we ate this amazingly decadent desert. This crepe not only tasted incredible but also looked absolutely scrumptious, from the dollop of whipped cream to the drizzle of Nutella on top. When we were finished there was not a dollop of Nutella left on the plate as we fought over the last bite. In summation Field of Creams Café is not your everyday concession stand, although they do serve up some of the standards, like burgers, dogs, and chicken nuggets, for the less adventurous eaters in your clan. I suggest that if you have finicky friends or children let them stick to the conventional menu items while you unleash the foodie in you when ordering your food. Some people might not enjoy the fact that there is no indoor seating but I for one think that this aspect only adds to the charm, and I was able to bring my pooch with me, which I always enjoy. I also love their motto, which is a play off the quote from the movie Field Of Dreams, “If you serve it, they will come.” As for the park atmosphere, you can’t ask for much more if you have a family, a park for the kids, a skate park for the teens, and classic cars for the parents, all for free I might add. As a reminder, Field of Creams Cafe’ is a cash only establishment. Furthermore, Continental Soldiers Park is about a mile from Lily’s favorite hiking spot, Ramapo Reservation, so we decided to walk off some of the desert we just ate which was the perfect ending to a wonderful night.